One of the most beautiful areas on earth, Il Promontorio del Gargano (gar·GAH·noh) is the promontory sticking out above ‘il tacco’, the heel of Italia. You can also think of it as la caviglia-the ankle spur of Italia. Surrounded by the Adriatico on 3 sides, the area is more like an island; biodiverse with unique flora and fauna. Most of the promontorio is a protected area and marine reserve, Il Parco Nazionale del Gargano, which includes le Isole Tremiti and the ancient Foresta Umbra. Fortunately, this has prevented overdevelopment by large multinational hotels and resorts. Nothing like having a spiaggia all to myself! We were going to paddle by canoa-kayak to la Grotta dei due occhi, a sea cave 10 minutes away. Unfortunately, it became too windy to go, so I will hopefully have the opportunity to go again. The campsite had a shuttle bus to whitewashed Vieste, 20 minutes away. 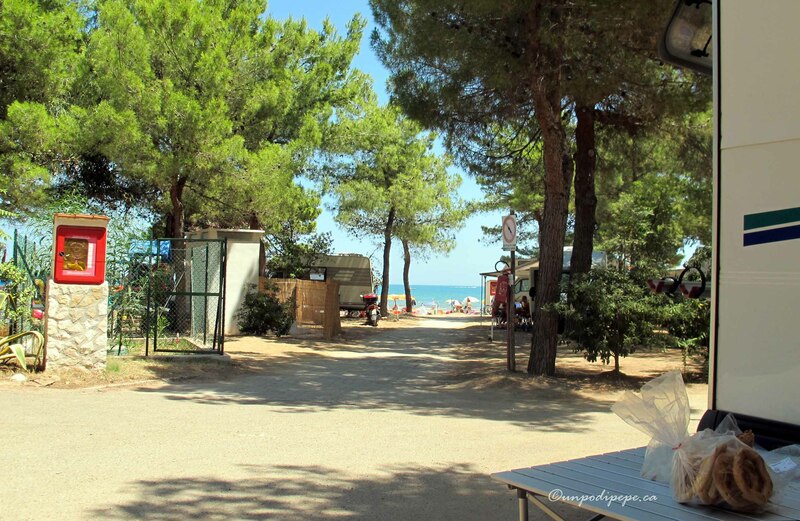 Read about other campsites I have stayed at in Campeggio sul Gargano. The winding road around the Gargano, SS 89 from Foggia, has sharp turns and viste mozzafiato (VIS·teh moz·zah·FYAH·toh)-breathtaking views. You will not see any dehydrated (yuk!) camping food in Puglia. Most campsites have a little market selling fresh fruit, giant watermelon, mozzarelle and other necessities. 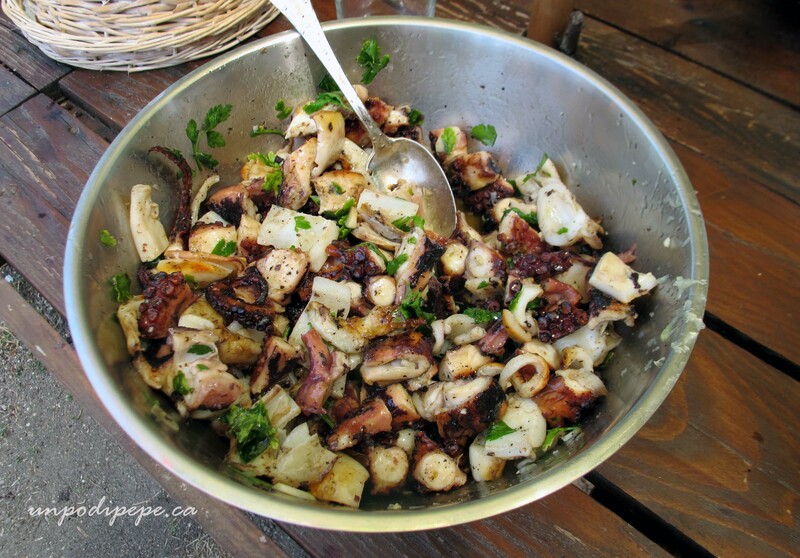 Fresh fish is never far away, so I get to enjoy Mauro’s insalata di polpo ubriaco-drunken octopus salad! 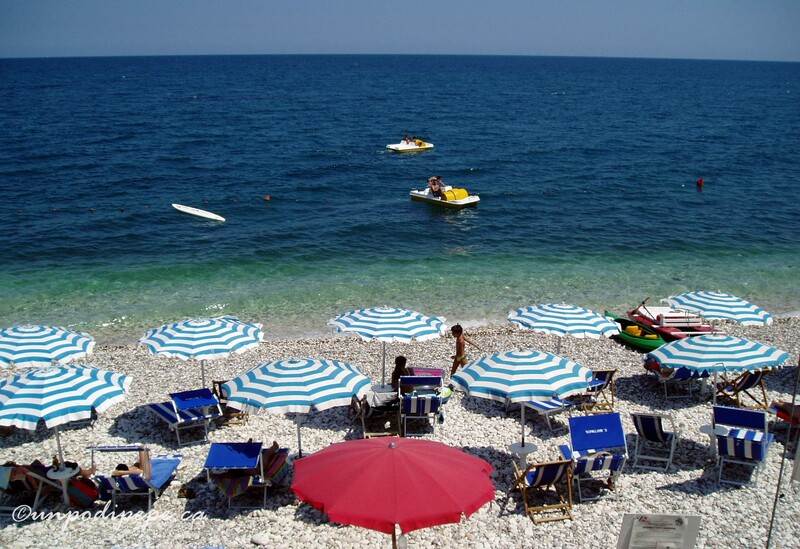 Most of the tourists visiting the Gargano area are Italian, especially in the summer. Many Germans drive their campers down too, but you will not meet many North Americans here. Il Gargano is the place to visit to improve your Italiano! This post is written as part of the monthly #dolcevitabloggers linkup, hosted by Jasmine of Questa Dolce Vita, Kelly of Italian at Heart and Kristie of Mamma Prada the 7th -14th of every month. This month’s topic is ‘Hidden gems’. Il Gargano is not so much ‘hidden’, as remote, unknown and not easily accessible without either a car or a lot of time. I hope you all make it here one day! 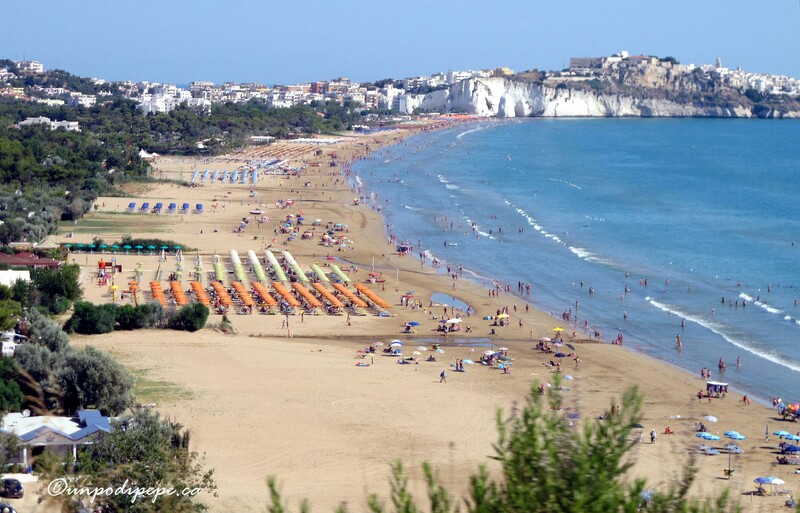 As the Gargano website says, visit il Gargano ‘per una vacanza tra natura, mare e cultura’…for a holiday among nature, sea and culture! 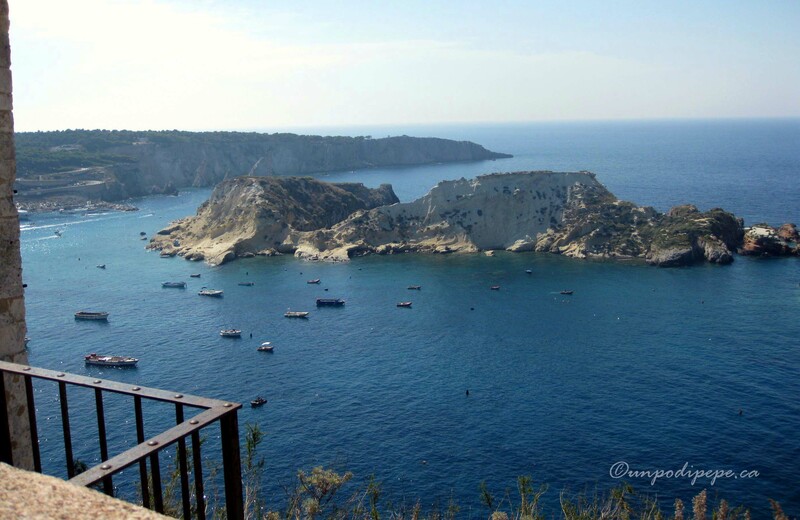 More Il Gargano posts by Cristina: Isole Tremiti, I Trabucchi del Gargano, Campeggio sul Gargano, Santa Maria di Siponto. Dovè la primavera? It was a long, cold winter, with far too much snow. Now la pioggia has set in. 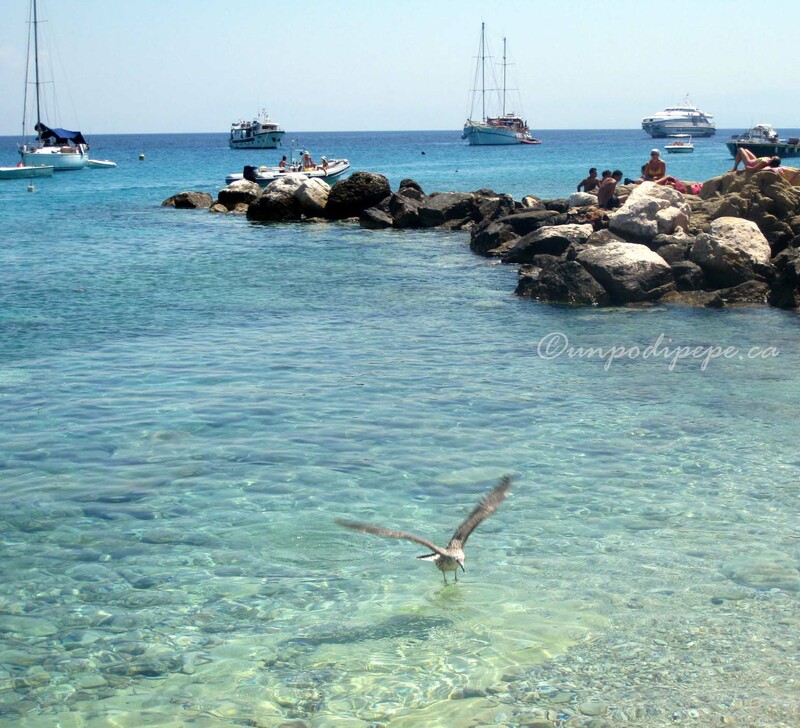 I am dreaming about il caldo, il sole e la spiaggia-warm weather, sunshine and the beach! 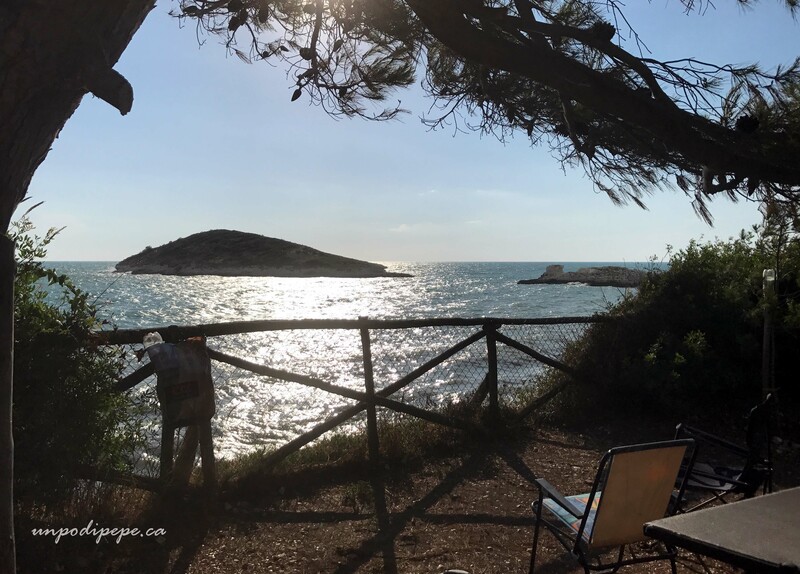 I have had the opportunity over the last few years, to spend many weekends at different sites in the Gargano (gar·GAH·noh) with my cugini and their camper. I would love to be there now! 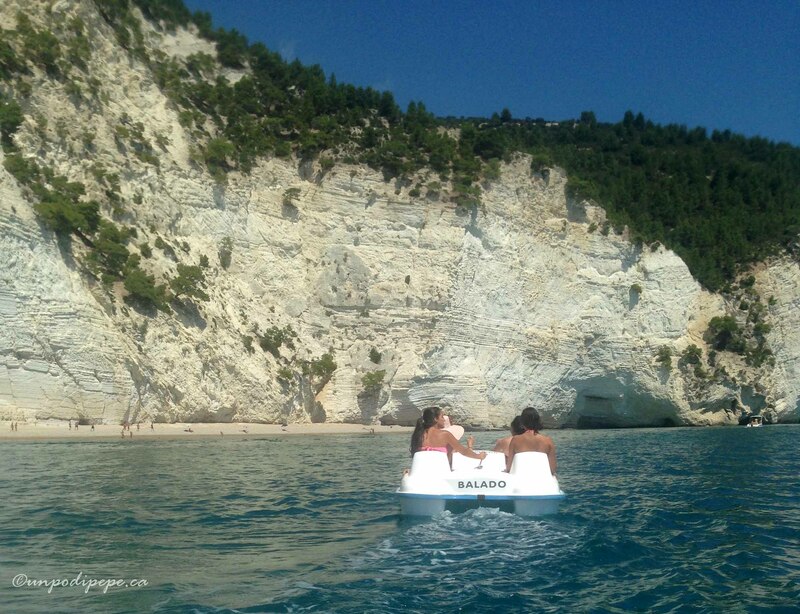 To get ready for summer and welcome warmer weather, I am sharing my favourite scatti from my Gargano travels. Il Promontorio del Gargano is the promontory sticking out above ‘il tacco’, the heel of Italia. You can also think of it as la caviglia-the ankle spur of Italia. 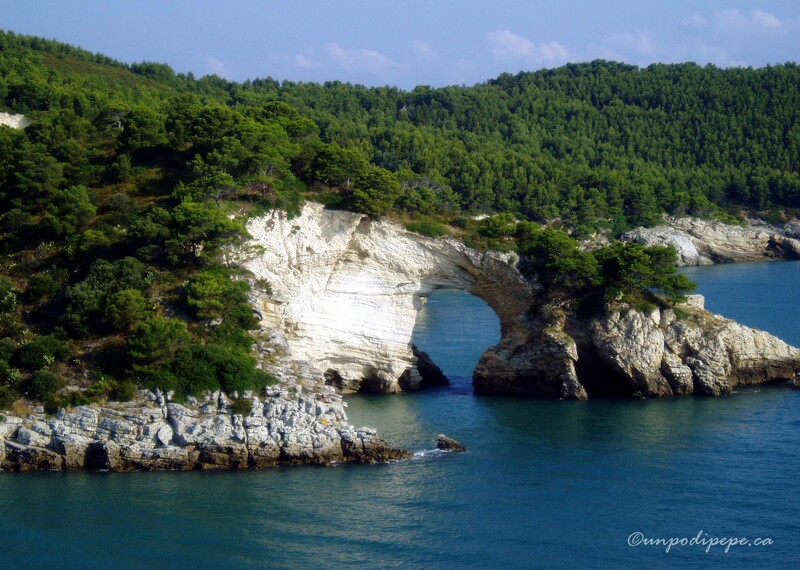 One of the most beautiful areas on earth, Il Gargano has unique flora and fauna. Biodiversity wise the area is more like an island-an island surrounded on 3 sides by the Adriatico with 1 side attached to Italia. Most of the promontorio is a protected area and marine reserve, Il Parco Nazionale del Gargano, which includes le Isole Tremiti and the ancient Foresta Umbra. Luckily this has prevented the area from being overdeveloped with large multinational hotels and resorts. Il Gargano is famous for picchi (woodpeckers) and many other birds, 300 varieties of orchids, almonds and olives. 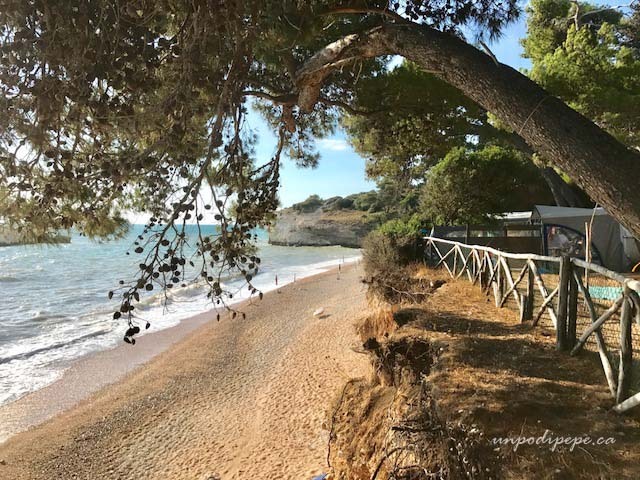 There are also endless ancient hillside olive groves, pine forests, sea grotte, limestone cliffs, rocky shores, crystalline water and fresh seafood. 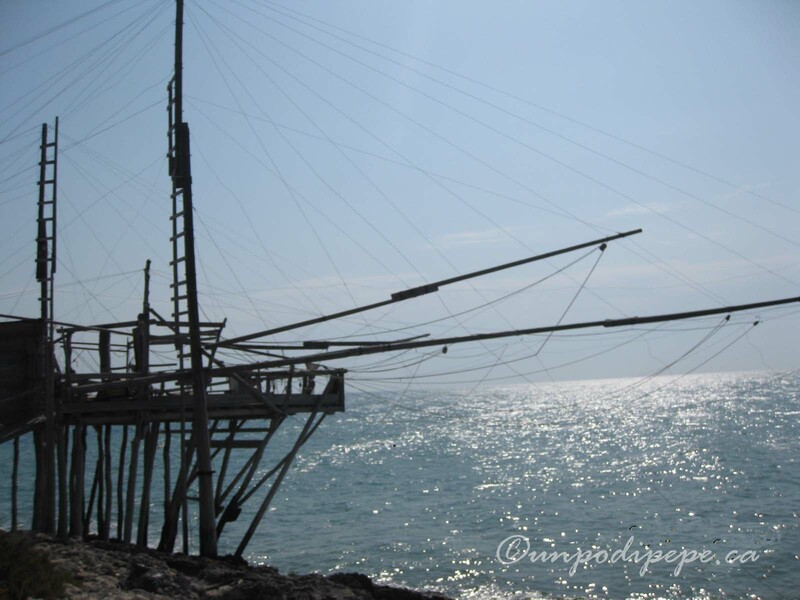 The coast between Peschici and Vieste has 13 working trabucchi, fascinating ancient fishing contraptions which I wrote about in this post. The winding road around the Gargano, SS 89 from Foggia, has sharp turns and viste mozzafiato (VIS·teh moz·zah·FYAH·toh)-breathtaking views. One of my favourite viewpoints is La Baia delle Zagare. 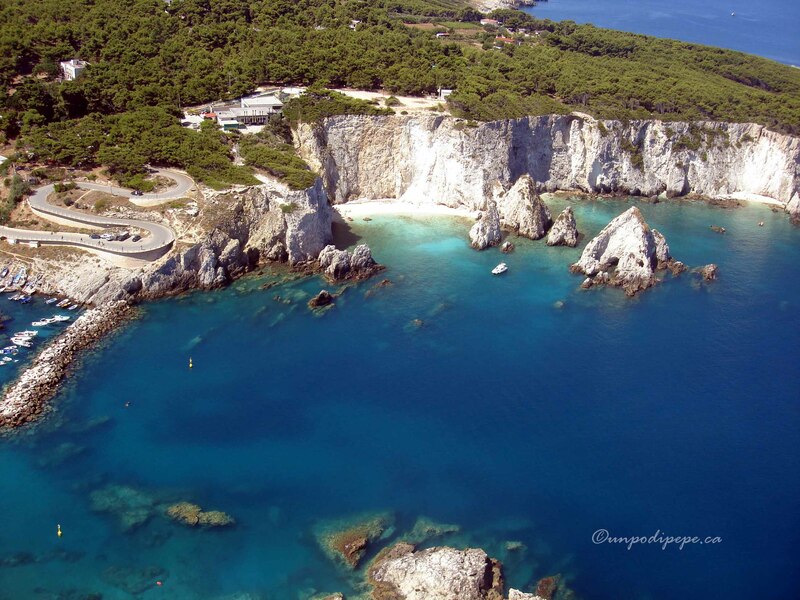 Here you can see the clifftop 4 star resort of the same name, and its private spiaggia. There is a glass elevator built into the cliff-something I have to see for myself one of these days! 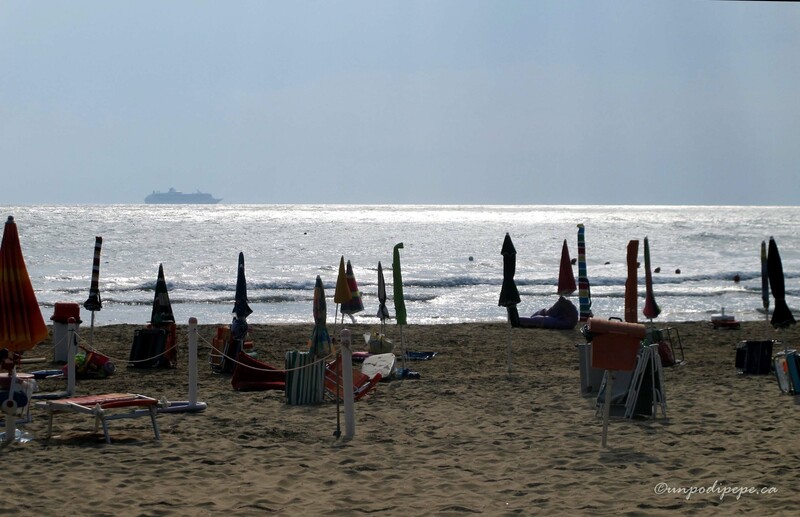 Il Gargano is full of campsites, inexpensive accommodation and B & B’s. The campeggi e villaggi turistici -campsites and tourist villages, are ben attrezzati (well-equipped). You can camp with a camper and all the accessories, or just a vehicle and a tent. 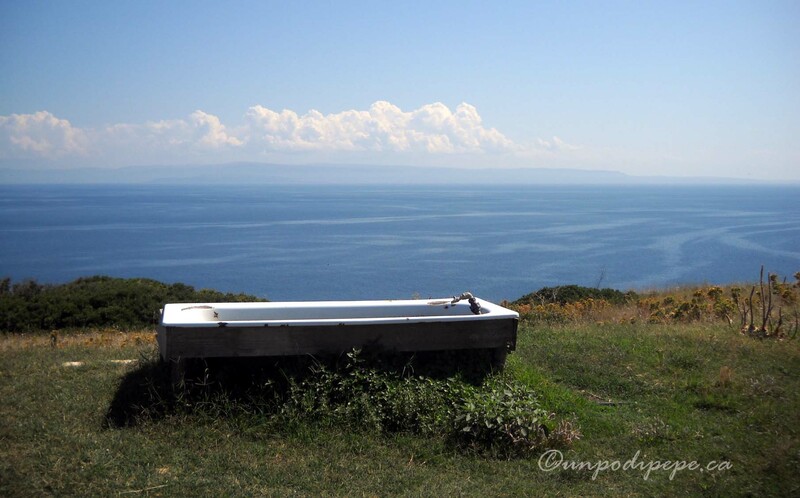 There are also villette-little cabins that can be rented, but you have to bring your own sheets and towels, so these are mostly used by locals. Some campsites even have a small hotel attached. This website (in Italiano) lists Gargano campsites. 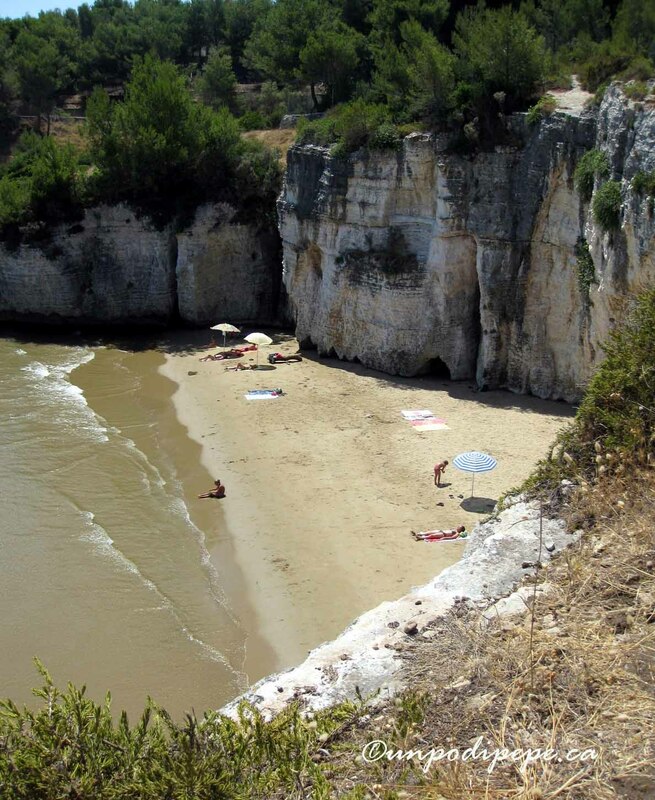 I have stayed right by the water and in an olive grove near Mattinata, and had a view of the beach near Vieste. Our setup is always comfortable and rustic, but some of the things you see at the campeggi are hard to believe. Families set up for the whole summer, with those working joining in on the weekends. I have seen TV with satellite, ceiling fans, generators and portable kitchen tents. 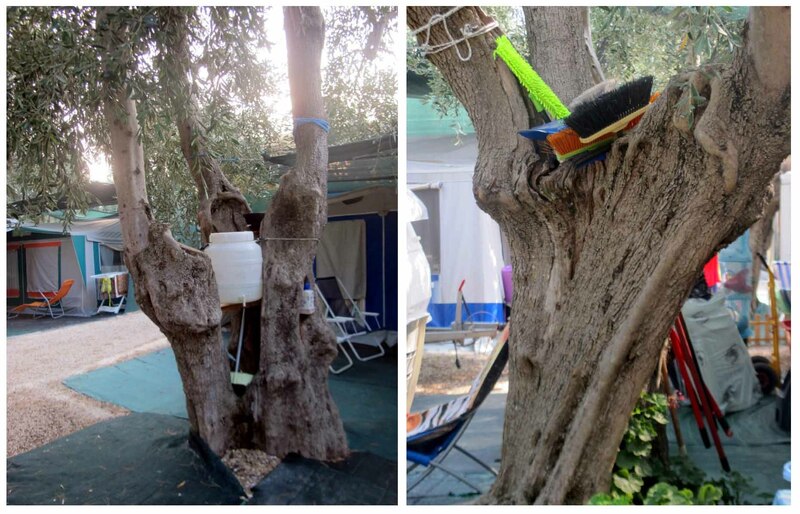 Last year at Camping degli Ulivi in Mattinata, the family across from us had brought 5 kinds of brooms! No yucky dehydrated camping food is found here! Fresh seafood is available from the mobile fishmonger il pescivendolo (pesh·ee·ven·DOH·loh) driving around to the different campsites. 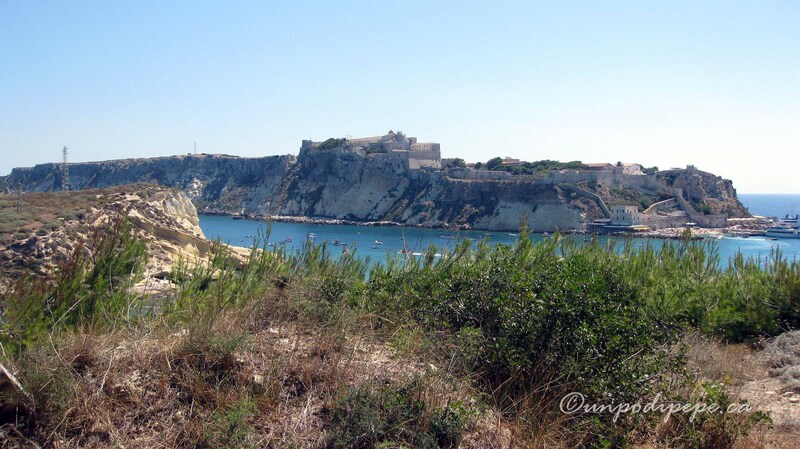 At Villaggio Camping Punta Lunga, we walked 2 km to Vieste to il pescivendolo along the amazing clifftop trail. Vignanotica is between Mattinata and Pugnochiuso, closer to Pugnochiuso. It is surrounded by a wall of limestone cliffs and is only accessible by walking down the steep hill. 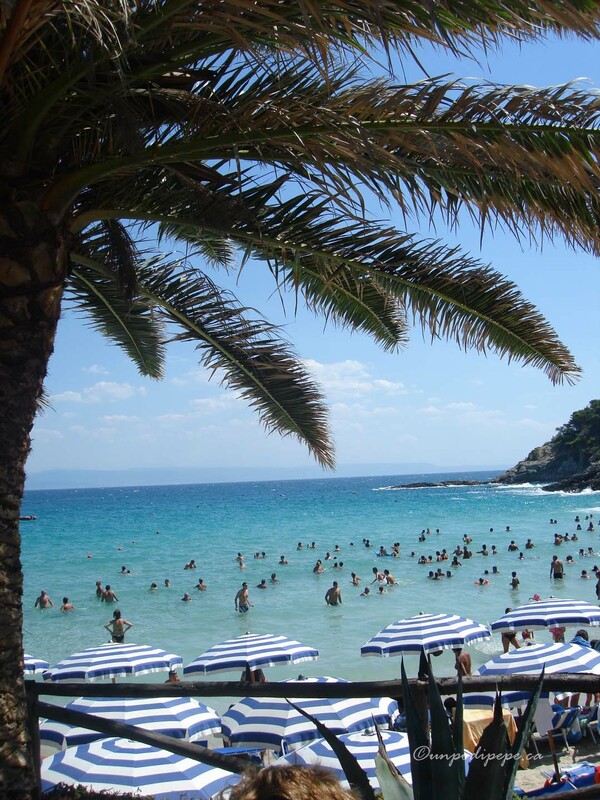 Inaccessibility prevents development on the spiaggia. Parking is available in an olive grove, right under the olive trees for €7 and there is a shuttle down to the beach. Vignanotica can be crowded on Sundays in the summer. There is a small bar on the beach. Vignanotica is in sun until about 2pm, then it is in full shade from the cliffs. 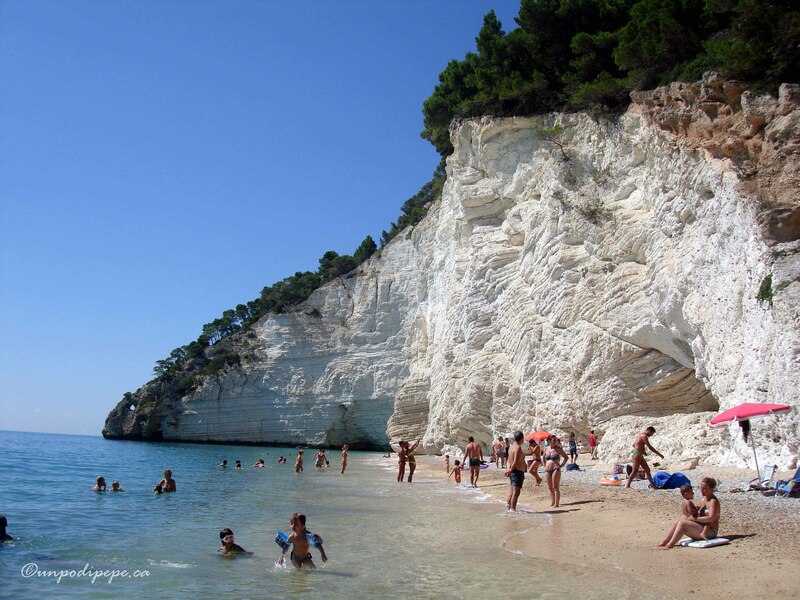 Some of the Gargano beaches, including Vignanotica, Mattinata and l’Isole Tremiti are rocky, so water shoes are needed to walk in the water. Vignanotica. The tiny people walking on the beach provide scale for the limestone cliffs. 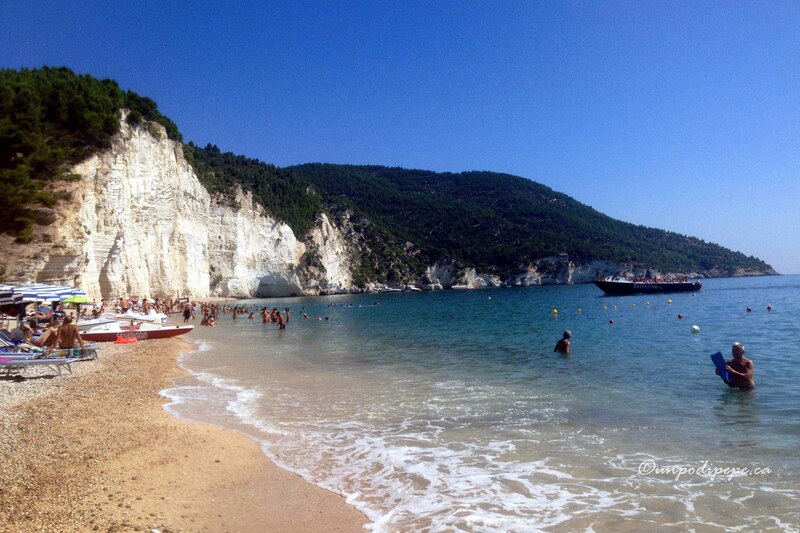 Most of the tourists visiting the Gargano area are Italian, especially in the summer. Many Germans bring their campers too, but you do not meet a lot of North Americans here. Il Gargano is the place to visit if you want to improve your Italiano. The closest major airport for Il Gargano is Bari. 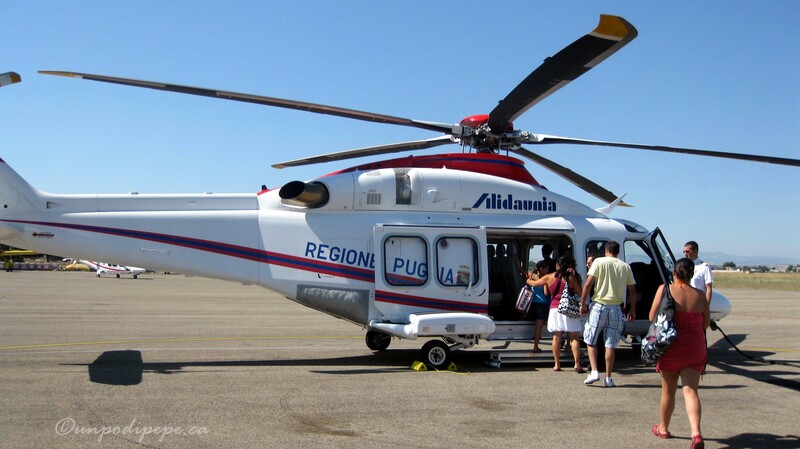 The airport in Foggia sometimes has flights to and from Milano, but usually it just has Alidaunia helicopter service to le Isole Tremiti, San Giovanni Rotondo, Vieste and Peschici. It is difficult to get around the Gargano without a car unless you have lots of time. The SS 89 from Foggia is the major road. 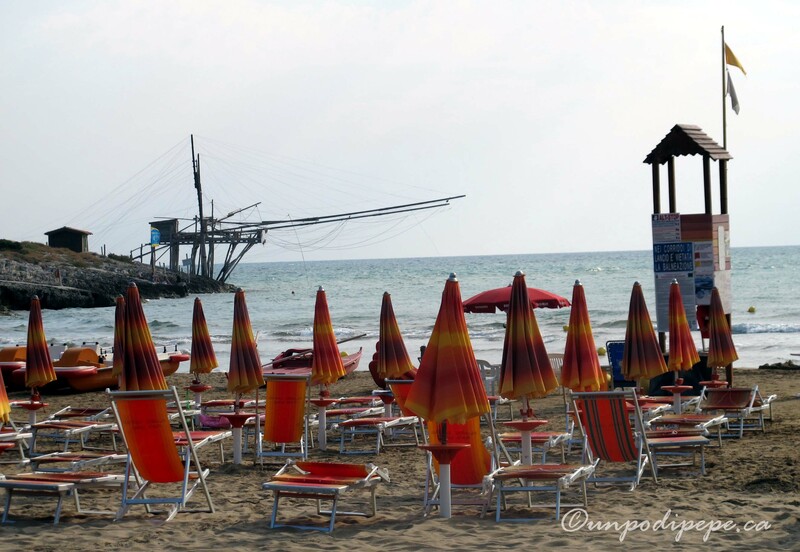 On the way, be sure to stop and visit Santa Maria di Siponto near Manfredonia. There is no rail service after Foggia, except a local train from San Severo to Peschici. Ferrovie del Gargano buses outside the Foggia stazione leave for towns in the Gargano, but they are not frequent . Parkinbici is a bikesharing service between Gargano towns. For visitors, a weekly card is € 20 and weekend € 12. 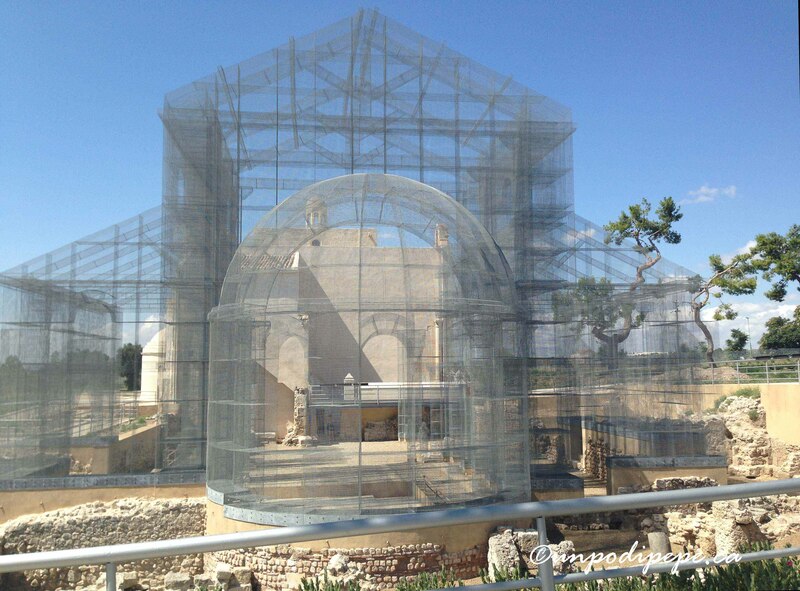 Santa Maria di Siponto is just off the SS 89 Garganica highway, 3km from Manfredonia. The church was built in 1117 over an existing early Christian structure. The architectural style is Romanica Pugliese, Pugliese Romanesque with Byzantine and Islamic influences evident in its pure, simple lines and geometric patterns. The building is unusual as it is square and there are 2 independent churches; the upper church and the crypt below, with an external staircase. To the left of the church is the Parco Archeologico di Santa Maria di Siponto. Until March 2016, this consisted of the ruins of a Paleochristian basilica (250 AD) with a semi-circular apse and mosaic pavement, and the partially excavated remains of Ancient Roman Sipontium. 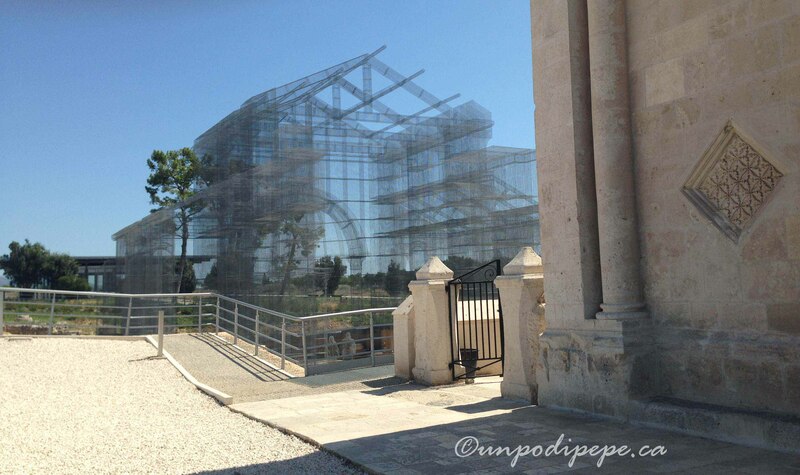 Now the space once occupied by the basilica has been transformed into a magnificent sculpture titled ‘Dove l’arte riconstruisce il tempo’ which means ‘Where art reconstructs time’. 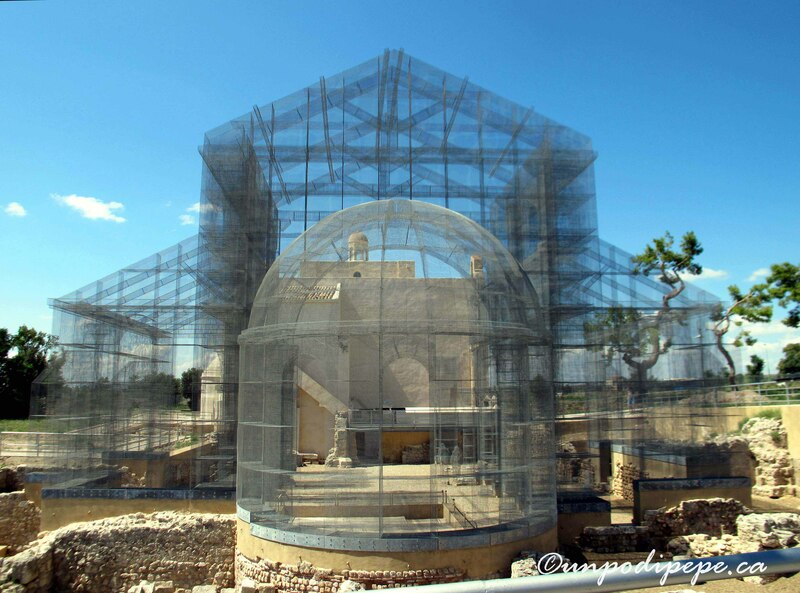 The permanent installation took 3 months to construct and is built right onto the foundations of the archeological remains. 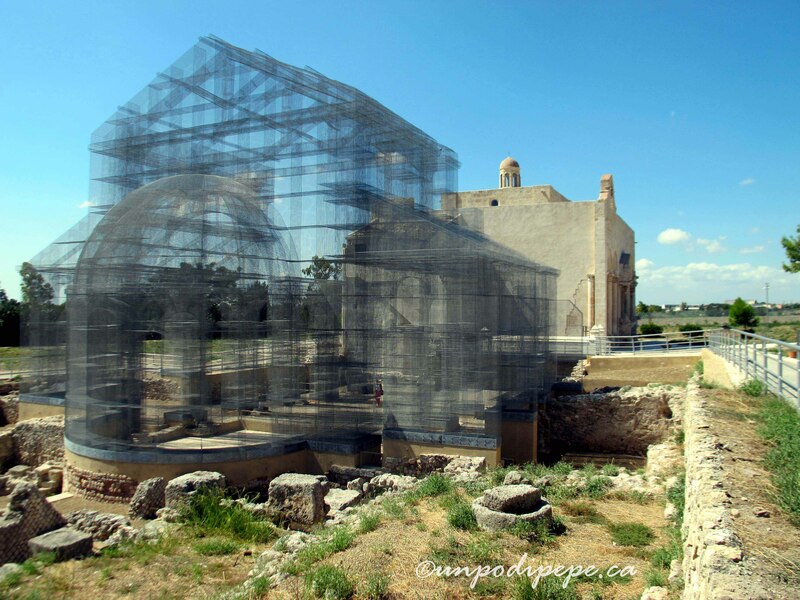 The installation/sculpture is made of layers of wire mesh that overlap and intersect, interpreting and reclaiming the space and volume once occupied by a structure that no longer exists. The lightness and transparency of the material makes it look like a hologram of the original church…it is there, but it is no longer there. The site is also illuminated at night, creating a ‘ghostly’ effect. Contemporary art and archeology intersect to form a link with the past. 14 m high and weighing 6,000 kg, this is probably the largest structure in the world made entirely of wire mesh. I have been to Santa Maria di Siponto many times since I was a child. 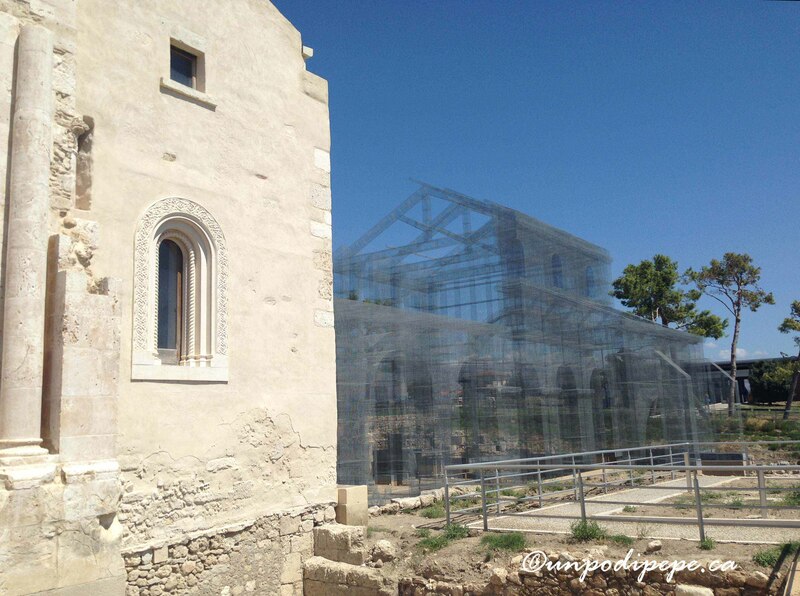 I am a total archeology nerd, and I was excited to see this construction breathing new life into this small archeological site, relatively unknown outside of Puglia. It feels like the basilica has been resurrected from the ruins. I have not seen anything like this before and it is already a distinctive landmark, especially since it is visible from the highway. In 5 months it has already brought 100,000 visitors to the site and contributed to the local economy. 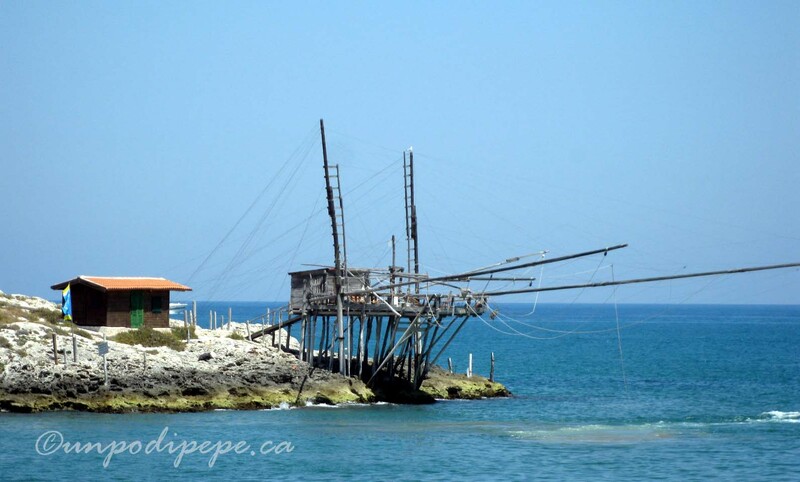 Trabucchi (tra∙BOO∙kkee) are fascinating old fishing contraptions found on the Adriatic coast of Abruzzo, Molise and Puglia. When I was young, I remember taking ‘L’Adriatico’-the night train from Bologna to Foggia- on a stormy night. With the sound of the wind and the waves the crowded train was not a place I was going to get any sleep. Once the train reached the coast, I spent most of the trip looking out the window watching the waves crashing onto these strange giant spidery things in the water. To my wild imagination, they seemed like giant wooden aliens or octopi that would come to life at any moment with their tentacles thrashing in the surf. 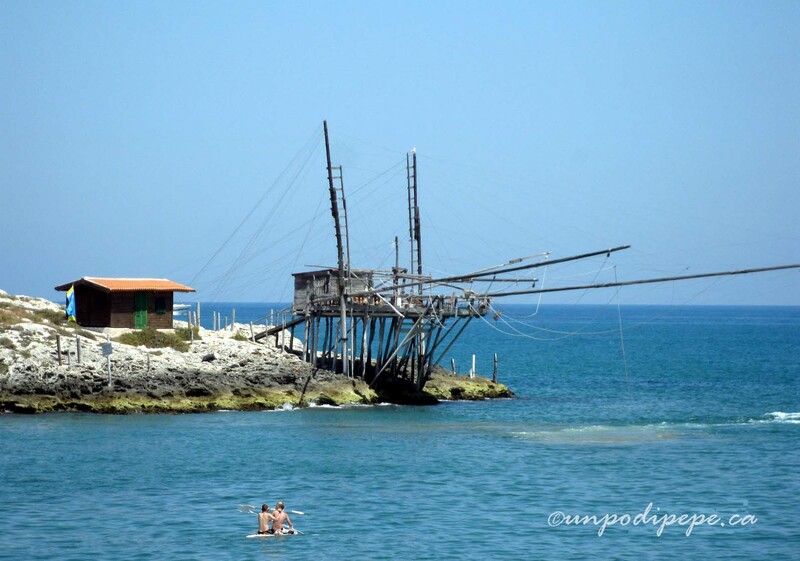 A trabucco is made up of a wooden platform on poles anchored to a rocky cliff or promontory, with several long wooden arms jutting out over the sea. 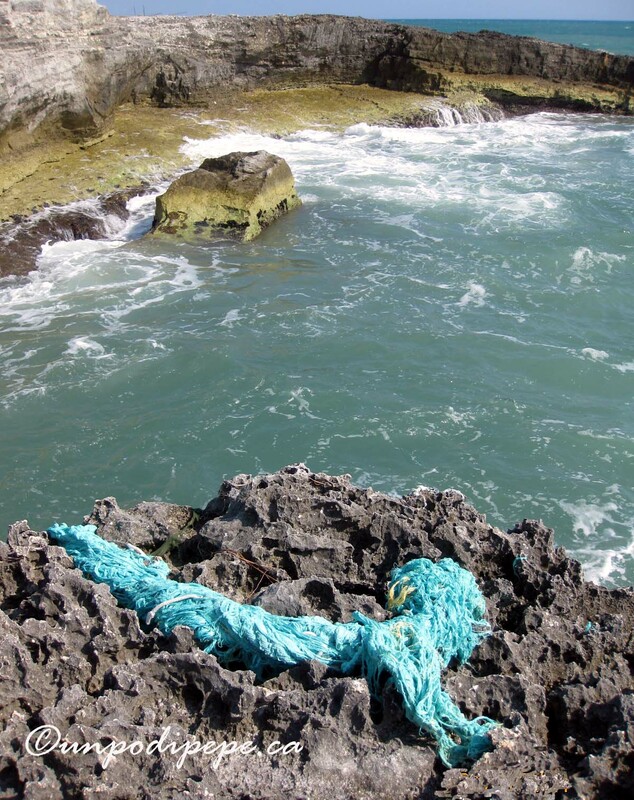 The arms have a system of ropes and winches suspending a giant narrow-mesh net called a trabocchetto. Trabucchi are made of Aleppo pine which is abundant in the area and is resistant to salt and weather conditions. Along the coast of the Promontorio del Gargano (Gargano Promontory) there are 13 working trabucchi between Peschici and Vieste. The oldest dates from the 18th century. They are protected as National cultural heritage sites within the Parco Nazionale del Gargano. Here is a link to a Trabucchi del Gargano map. Although there is no documentation, Pugliese historians believe the trabucco design is imported from the ancient Phoenicians. They really are an ingenious way of fishing to take advantage of the rocky coastline and crystal clear waters of the Gargano. 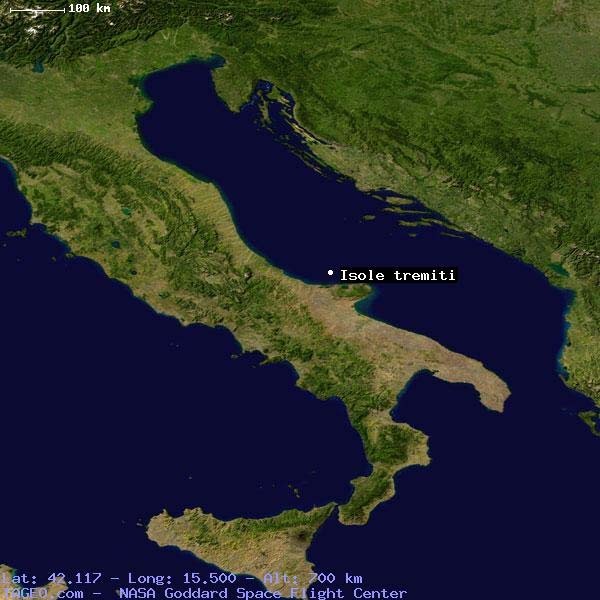 Trabucchi are built facing SE or NW and where the water is at least 5 m deep, to take maximum advantage of the marine currents. A trabucco requires 3-4 operators or ‘trabuccolanti’. 1 or 2 trabuccolanti look out for schools of fish swimming along coastal currents. They give word, then the other 2 operate winches to drop the trabocchetto (net) and quickly hoist it back up full of fish. 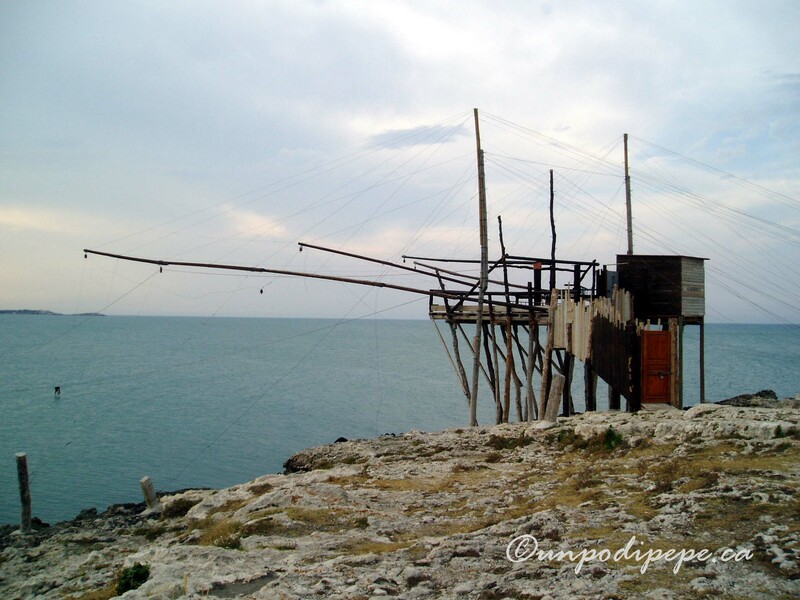 Gargano fisherman of old really created an extension of the land-with a trabucco they were able to fish from the rocky cliffs and did not have to ‘get their feet wet’ or take boats out in dangerous agitated seas. 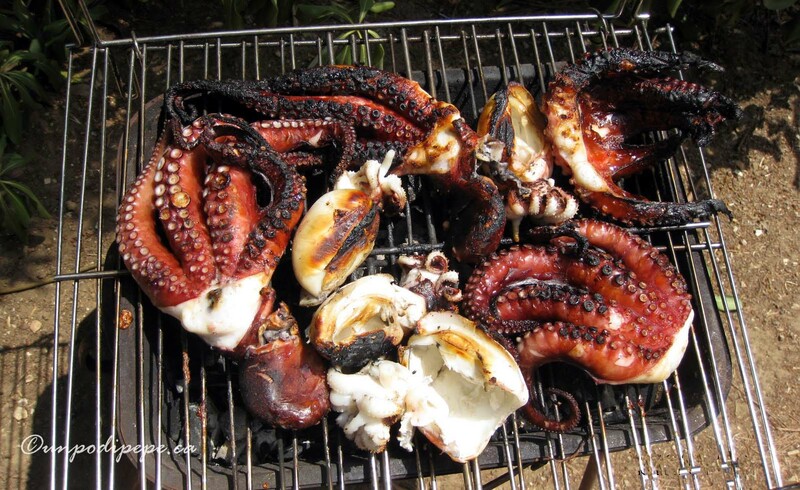 Trabucchi have become symbols of ancient maritime culture. 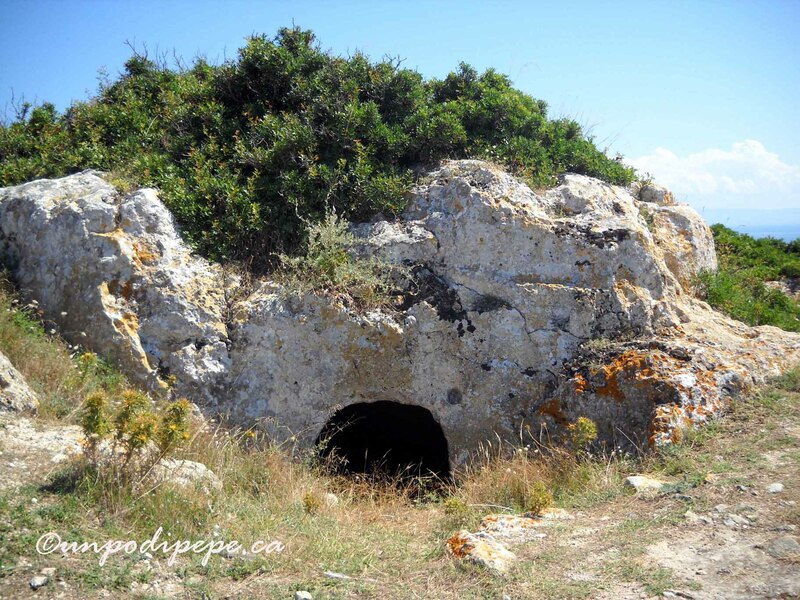 I’ve been on several weekend camping trips in the Gargano with my cugini, and have been able to visit several trabucchi. 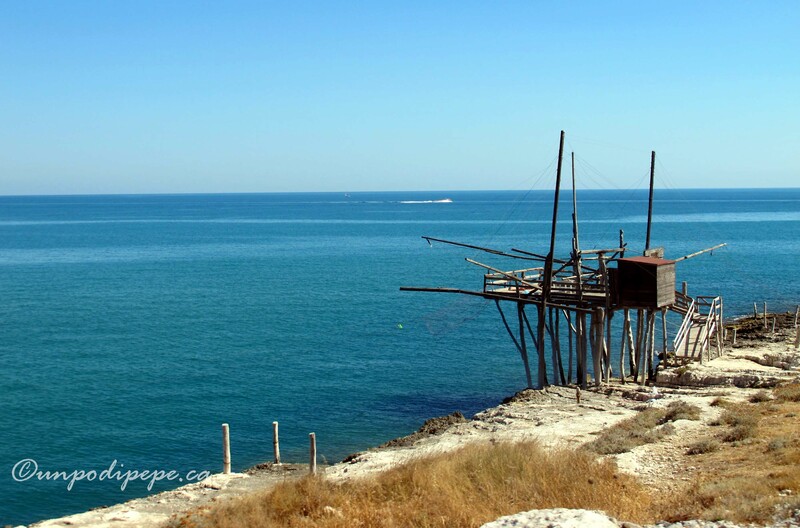 Imagine my excitement 2 years ago when the beach by our campsite at Punta Lunga, 2km north of Vieste had it’s very own trabucco! The Isole Tremiti (ee∙SOH∙leh treh∙MEE∙tee) are an archipelago of 3-5 islands-depending on what you consider an island-in the Adriatic Sea, 22 km off the coast of Italia. The Tremiti, considered ‘le perle dell’Adriatico’ (the pearls of the Adriatic), have been inhabited since at least the 4th century BC. 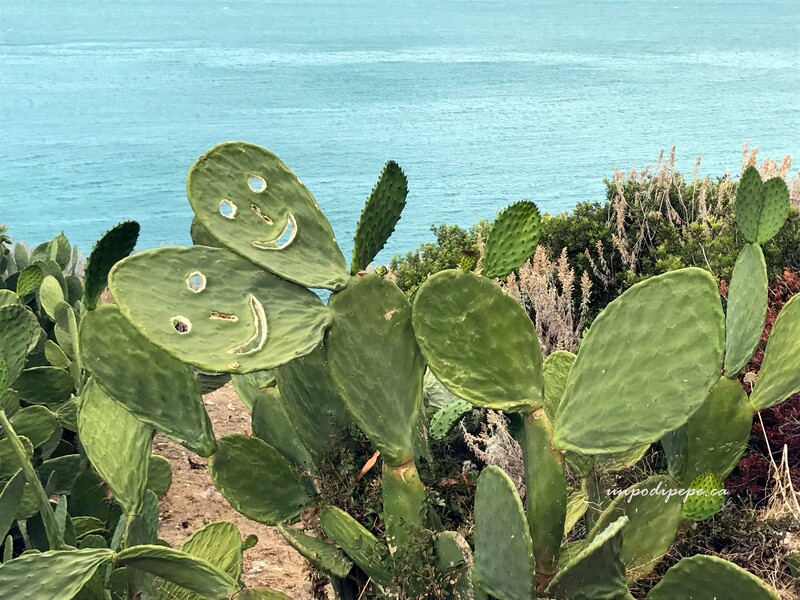 They are part of the Parco Nazionale del Gargano (Gargano National Park) http://www.parcogargano.it and have been a protected Marine Nature Reserve (Riserva Naturale Marina Isole Tremiti) since 1989. The clear waters make the islands a popular spot for snorkeling, scuba diving and even bird watching. San Domino is the largest island and has most of the facilities such as hotels, restaurants, the Tremiti Diving Center, and the heliport. 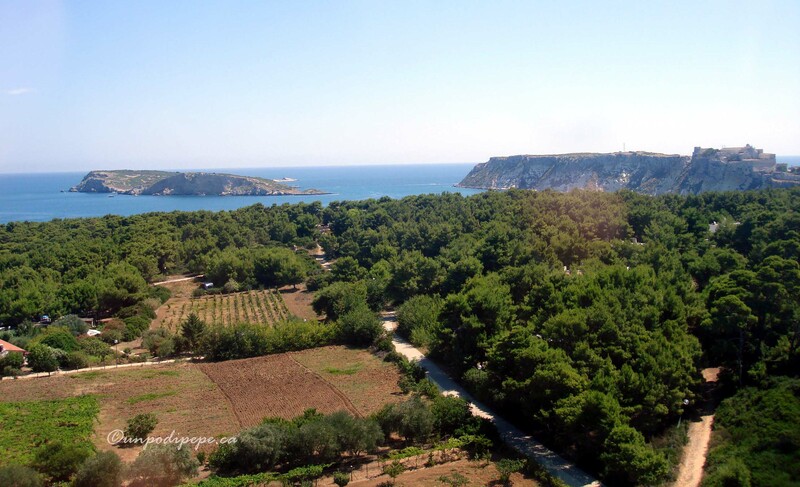 It is covered by lush Aleppo pine forest, capers and rosemary, and surrounded by small coves and sea caves. 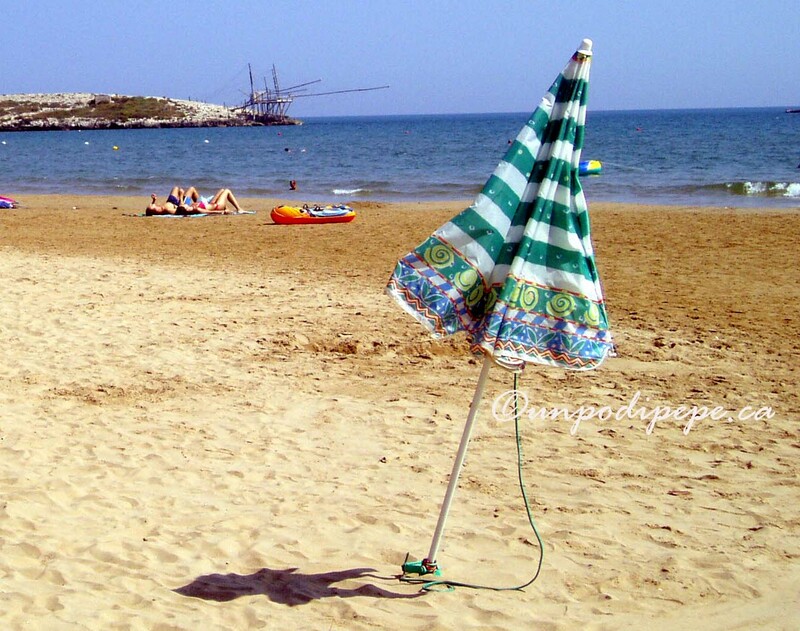 San Domino has the Tremiti’s only sandy beach –Cale delle Arene. 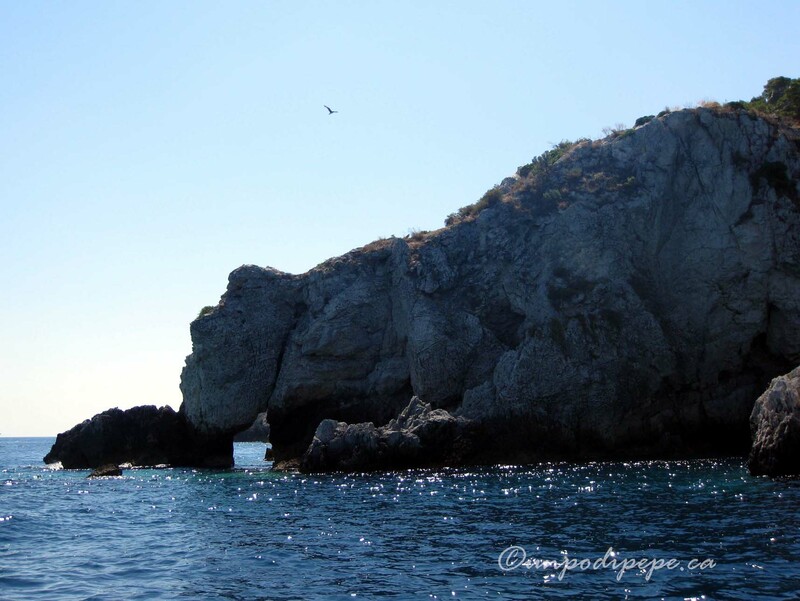 The rocky coves are beautiful to explore and swim-but don’t go barefoot! My friend stepped on a riccio di mare (sea urchin) and it was not fun. There is a 2 hour walk around part of the island and bicycles are available for rent. San Nicola is the administrative and historic center of the islands, and where most of the 400 or so permanent residents live. The 11th Century Benedictine abbey and church of Santa Maria del Mare seem to rise up out of the limestone cliffs, with fortified walls starting at the port. The church has a beautiful 11th century mosaic floor and a Byzantine painted wood crucifix that was likely brought here by monks fleeing from the Crusades. Capraia (or Caprara) is rocky and uninhabited except for sea birds. It is named for the capers that grow there. 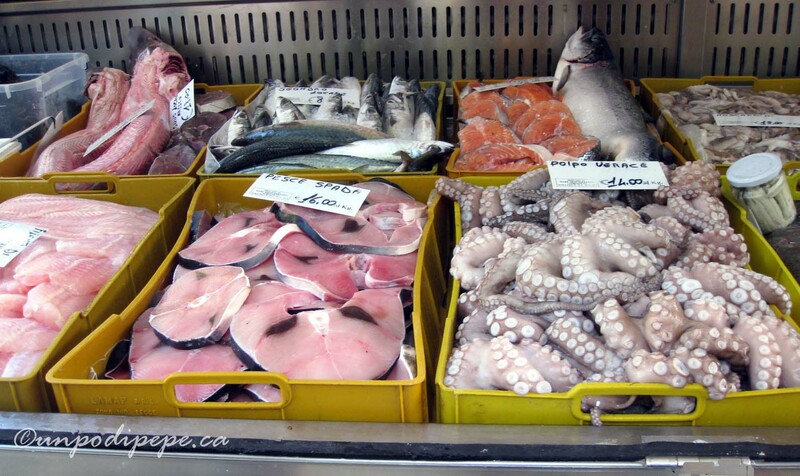 There is no organized transport to Capraia, but local fishermen can be hired to take people over. San Nicola and Capraia. Yes those are solar panels down there! Cretaccio is an uninhabited halfmoon shaped block of yellowish clay between San Domino and San Nicola. Cretaccio literally means ‘big hunk of clay’. 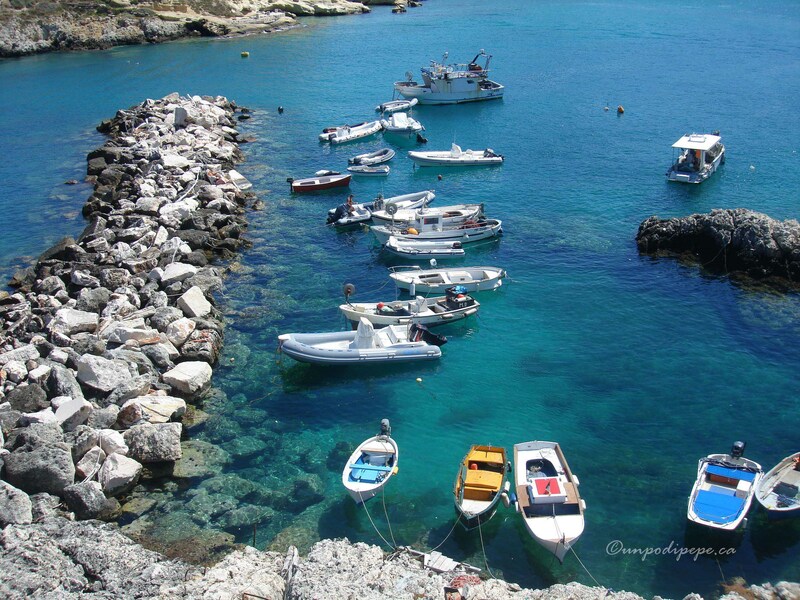 Pianosa is 11 km away from the other islands and is the most northern point of Puglia. It can be covered by waves during storms, as the elevation is only 15 m. The waters surrounding Pianosa are in zone A of the Marine Reserve, so access is strictly prohibited except for approved marine research. 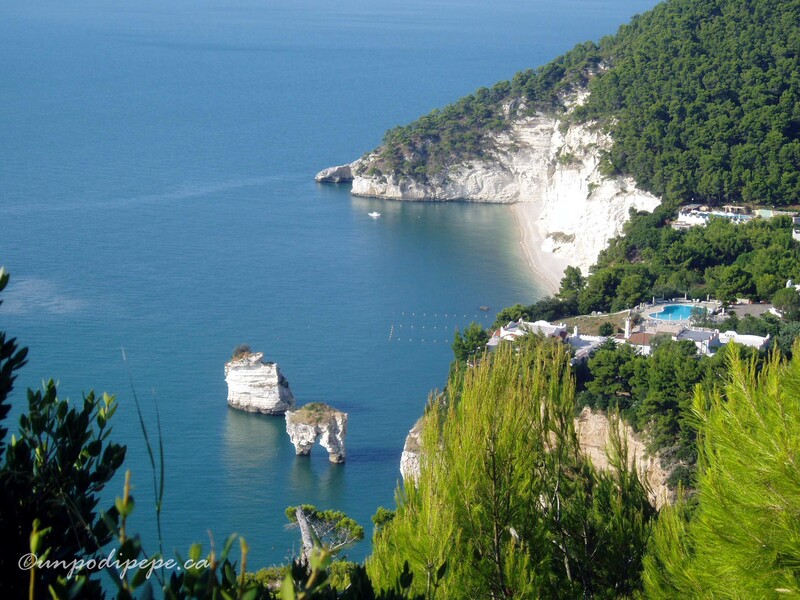 The islands are sometimes known by their former name ‘Le Diomedee’ or ‘I Sassi di Diomede’ and you see a lot of things in the Gargano area called ‘Diomede’. 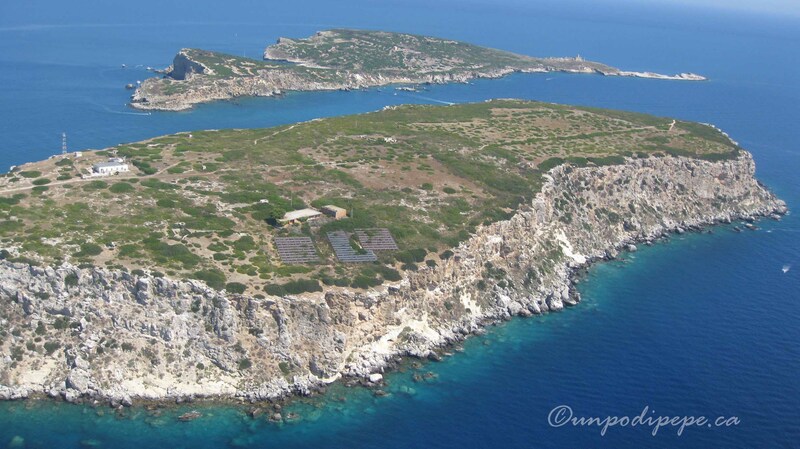 According to legend/mythology, after the Trojan War, the Greek hero Diomedes settled in the Daunia area (Province of Foggia) and created the islands with 3 rocks he threw into the Adriatic. He was also shipwrecked on the islands with his crew and possibly died here. La tomba di Diomede on San Nicola. 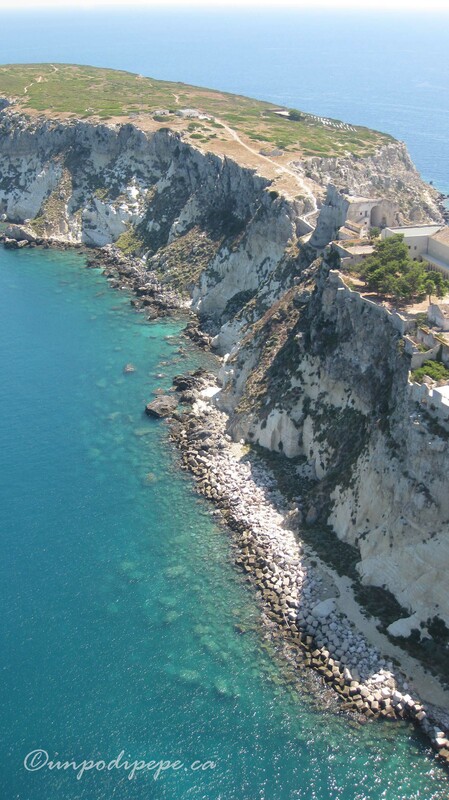 There is an unmarked Hellenic period tomb on San Nicola that is known as ‘la tomba di Diomede’. His crew was so upset at the loss of their captain that the Goddess Venus took pity on the grieving men and turned them into birds that continue to cry for their loss. The scientific name for the Great Albatross which is common in the area, is ‘Diomedea’. These birds look a lot like seagulls and make a noise that can sound like a crying newborn. In Fellini’s ‘Otto e mezzo’ (8½) there is a scene where a cardinal tells this story to Guido (Marcello Mastroianni). The islands also have a long history as a place of exile. Emperor Octavius Augustus confined his granddaughter Giulia to San Nicola for adultery with a Roman senator. She remained there until her death 20 years later. One of the necropoli beneath the abbey could be her tomb. Ferdinand, king of Napoli turned the abbey into a penal colony. A hundred years later, another Ferdinand tried to repopulate the islands with criminals and people moved in from the slums. For many years, the Fascists imprisoned those considered a danger to the public on the Isole Tremiti. One of the prisoners held there was Sandro Pertini, future president of the Italian Republic. I have visited the islands several times by helicopter. As you can see in the photos, the emerald water is so crystal clear you can see the bottom from the air! The wonderful thing about visiting the Isole Tremiti is that there are no large hotels or resorts. All of the hotels are small and surrounded by pine forest, so although this is a tourist destination, it doesn’t feel overrun with people. 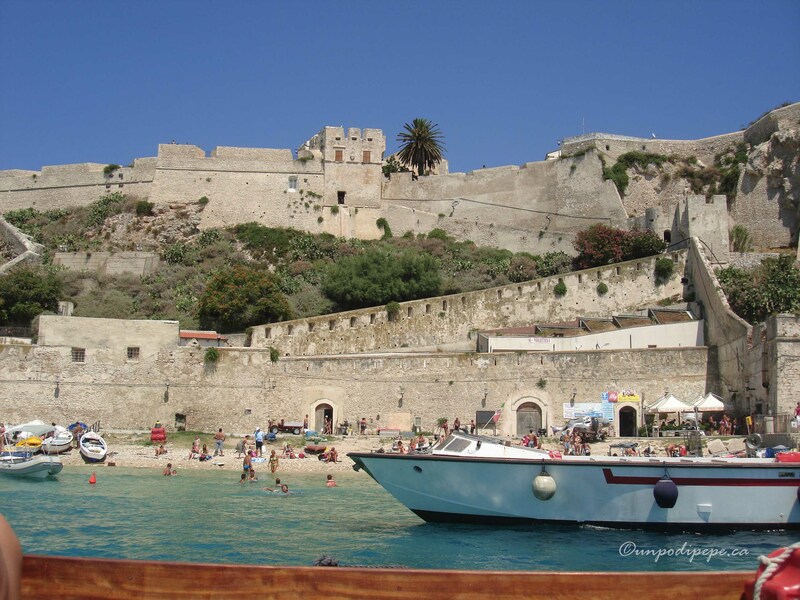 The Isole Tremiti are accessible by 1-2 hour ferry ride from Vieste, Peschici, Rodi Garganico, Manfredonia and Termoli, or by half hour helicopter ride from Foggia http://www.alidaunia.it .